This morning I managed to drag myself out of bed a bit earlier than usual to make my way to town. 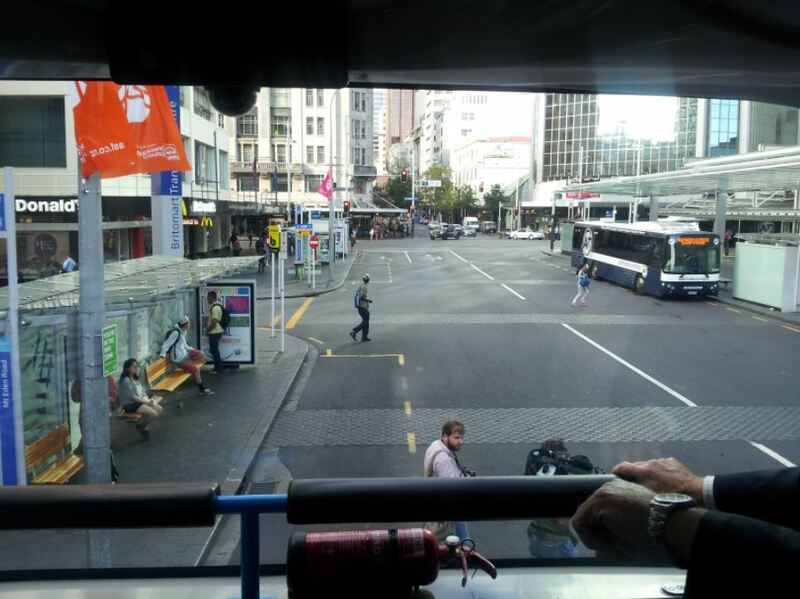 The reason for this was to ride on the first double decker bus that is going to be used in Auckland and I was very impressed by it. The bus looks and feels superb, both inside and out. The bus definitely turned a few heads as we drove past. A view outside the upstairs window with the single level NEX bus off to the right. I bet there will a lot of people wanting these seats on a nice day like today. From about the middle of the top level, looking back. 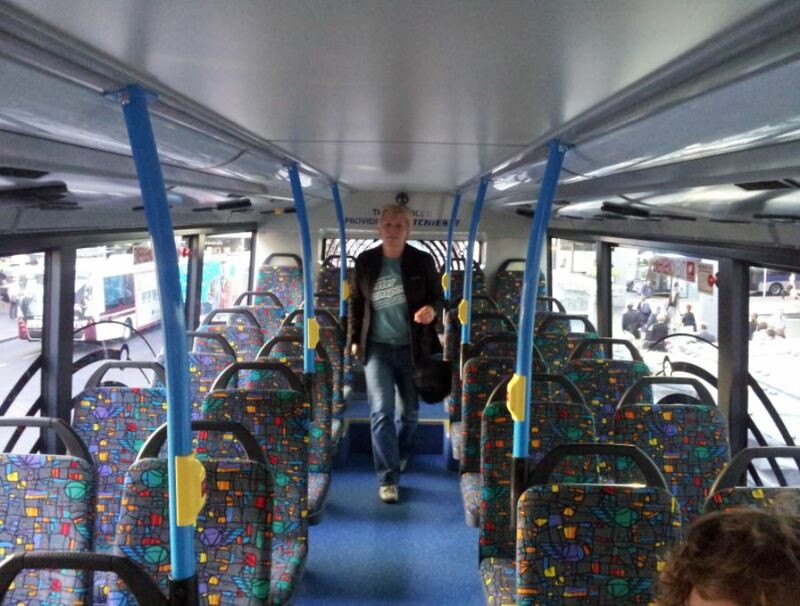 One of the great things is that the seats are more spaced out than other buses giving passengers more room. It was much more like you get on a train. 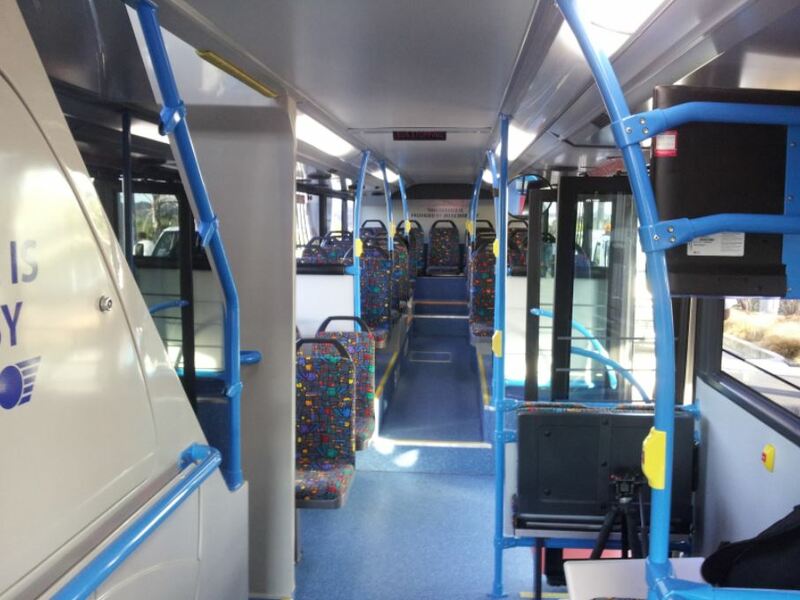 The great thing is that this is apparently now a requirement in the NZTA spec so we should be seeing it in other new buses in the future. All up the bus has 86 seats compared to the 51 on other NEX buses. The stairs to get to the top level, to the right there is even a little luggage area. And looking in the other direction on the downstairs level of the bus. Another great feature is that both of the doors are wide enough for two people to board or alight at the same time which will definitely be useful once HOP starts rolling out next month. Lastly from the upper level you get a stunning, unobstructed view across the harbour on the journey. All up, a very welcome addition to Auckland. The first normal run will happen next Monday. Looks like a sweet ride! How soon are the rest of the buses going to start running, if you know? This one is a trial and if successful, Ritchie’s will buy more of them. NZ Bus and Howick and Eastern are also looking at buying some, although I believe they are considering a different brand. So any word on when you can use your AT Hop card on it? Stupid that two things branded with the AT logo are incompatible. Yeah, but did someone actually confirm that? Should have started comms by now about phasing out the Ritchies pass etc. That is what was said at the last AT board meeting. They said end of April. I understand they are starting the roll-out with the NEX service. Would have been a great time to announce it – steal a bit of the thunder away from Ritchies and toward AT. Does the suspension do a better job of absorbing the bumps than the other buses? Good news that the seats are spaced wider, can you fit 2 normal sized adults side to side on this? Wider seat-seat distance is great – with my long legs, I almost HAVE to sit sideways in many of the current seating arrangements. Uhm, re-reading that, I am actually not sure. Are the sits further apart in travel direction, or sideways??? I think it is wider in both. I’m not as tall as you but I’m not short. I had a decent amount of clearance between my knees and the seat in front. Not sure about width but they definitely seemed like they were a bit better in that regard too. You will have to duck down a bit to up the top though Max as I was having to hunch a little to walk along the isle up top. Better ride and wider seats are 2 very welcome steps in the right direction! I’ll be fine then …..
“A brutal instrument in the context of a cityscape?” Dont be ridiculous. All heavy vehicles are much taller than humans, double deckers only a bit more so. So it doesnt block any more useful views for a human than a normal heavy vehicle. It would be interesting to compare the (real) cost of one of these to a tram, per passenger capacity. That might sober up those calling for trams. But they don’t have a couple of hundred of them at that price. Meh, as others said, at ~4.2m, it is not exactly higher than a high truck. Yes, it will be a bit imposing, but Auckland isn’t just suburbia anymore. We are urban too, and urban elements like this are part and parcel of that. I was never as opposed to bendy buses as soom seem to be (they are pretty cool too, in my mind), but double deckers work for me! Looking forward to some new ways of seeing the city. 3News article says they cost $700,000 but either way Auckland is moving forwards. Trams: off topic. Trying to flame it up? Just assuming your counterfactual. 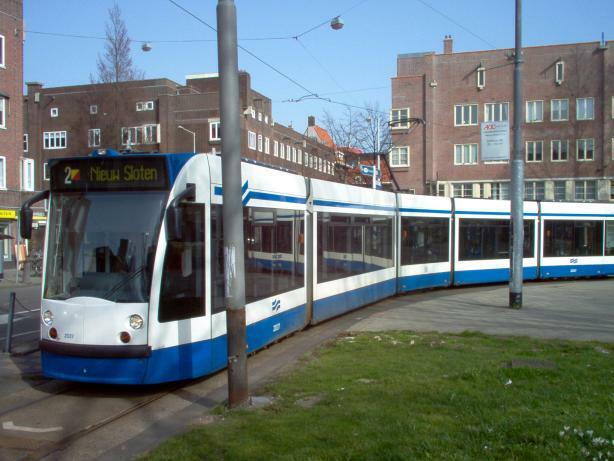 If not trams, what is it? More smaller buses, more cars, less people traveling? What I don’t get is why they choose to place the AT logo at the rear over the only window, why not lower down where there is no window at all? I still find AT appear over eager to plaster their logo over everything, I’m not aware of many other places where the transport authority puts as many and such large logos all over buses. Below the sign appears to be a grill which will be vents for the Engine – you cant block those. I assume the over logo’ing is them trying to establish the brand. It will be the first to have the AT hop card. I assume over time, the logos will reduce in prominence. Ritchies dont care as AT will be paying for the buses to be painted, not them. Anyone know why there is a screen/monitor above that luggage area? Next stop information on those maybe?? *The TV intruding on my bus ride, not bungy. I am just scared of bungy. There is one upstairs too, on the back wall of the stairs. Didn’t come on during the trip so I don’t know what it is going to be used for. 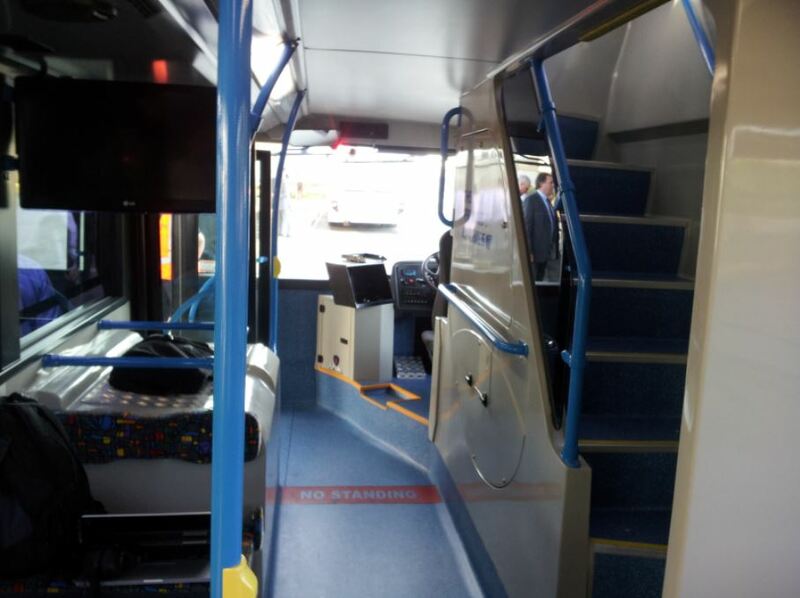 Other recently purchased NEX buses have the screens too and are used for nothing – if anything it shows the on-board cam showing what’s in front of the bus. Could be good for next stop/transfer data, otherwise leave it off! Double deck buses always look top heavy. Do they need any added weigh underneath to stop them rolling, or is the weight of the chassis and the engine enough to do the job? It’s a nice looking bus. Although not as good as a Routemaster. I miss being able to jump on and off the rear platform of a moving Routemaster. I’ve seen video footage of the London Bus Driver school where they actually try and tip them over for the cameras – was pretty hard to do as they seem to be able to stay upright. Mind you that empty of people up top. Also I recall Top Gear doing some stunt with one old Double Decker (some whacky stunt) and had a hard job tipping them over too. 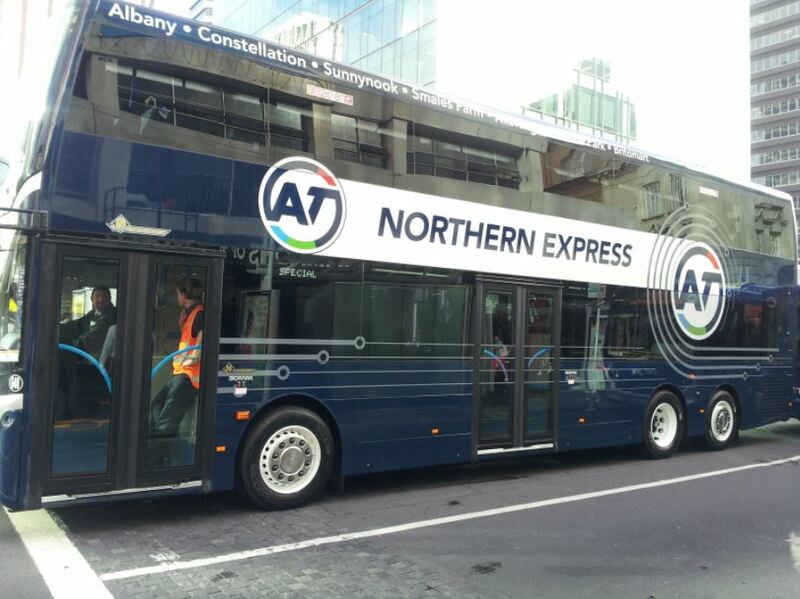 As for being able to jump on and off these buses – since they’ll be using these on the NEX Busway and Harbour Bridge, not being able to jump on and off these buses like the old Route Masters is actually a *good thing*. If you try squeezing a hundred people up onto the top level (more a Guiness book of Records thing than reality), that would still be less than 10 tons. Say 7 tons. An empty double decker apparently weighs almost twice that, and almost all that would be in the low portion. So pretty hard to tip, even if the lower level was all empty and the top all full… – required tipping resistance among buses is (at least in Europe) also very well-standardised. It also occurred to me after I wrote it that I’m probably too old and slow to jump on a moving Routemaster these days. Sprinting down a London street, dodging traffic, and throwing myself on to the platform of a moving bus was lots of fun at the age of 25. Now? The best outcome is failing to catch up with the bus. The worst is death. So double decked buses are stable. That’s good news. Other things that just don’t look as if they could possibly be stable are logging trucks and cruise liners. Some of the cruise liners seem to have about ten decks above water. Surely they can’t extend more than about 10m below water or they wouldn’t be able to tie up at wharfs. How do they not tip over in heavy sea? Oh, and just to get back on topic… I can’t believe the miles they get out of buses. I was chatting to a Greyhound driver in Australia some years ago. His coach was 15 years old. And still in good nick, I might add. They’re on the road 20 hours a day, so maybe 1500km a day. That’s 450,000km each year, and the 15 year old Greyhound may have done 6 or 7million km. The driver didn’t know much about maintenance. I assume that they replace the engine periodically, since I can’t imagine any engine would still be within tolerances after a million km. Well it shows how nanny we have become over the years where the public is no longer trusted to embark/disembark from a bus without nanny there to hold peoples hand. I think a 3rd door and extra stairwell would improve load times. We also have to take into account the awf (arse width factor) of society which has increased due to obesity, so that doorway where you think two people can get on/off is in the real world only sufficient for one because inevitably there will be someone with a huge arse blocking access. The centre of mass is a suitable distance below the centre of bouyancy. They are designed that way. There’s software that calculates the location of both based on 3D models. All we need now is an underground rail line. Agree, double-decker buses and underground rail/metro are a great combination. Saw this bus traveling in the morning, from the footpath on Queen St. It was fine. A herd of them might make a slight visual difference, but even just the improvement in emissions would easily outweigh that, for any city-dweller experiencing their company. Thank god this is happening, last stop to trains. Well, that was back in the day. What about in high winds on the bridge ? I was thinking that too………. Empty trucks can tip easier in high winds, I mean, compared to buses. London buses seem to cope with strong winds across the Thames…….. These buses can turn on a dime too, sometimes I dont know how these drivers do it. 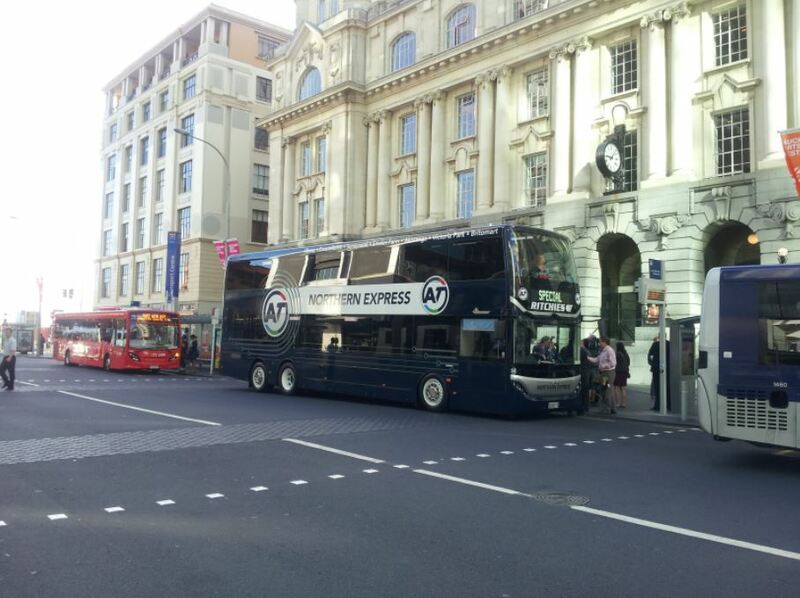 Especially in London where the roads are far narrower and busier than Auckland, I’m sure the new buses will be fine. I just want to see how quickly we end up ordering more of them! 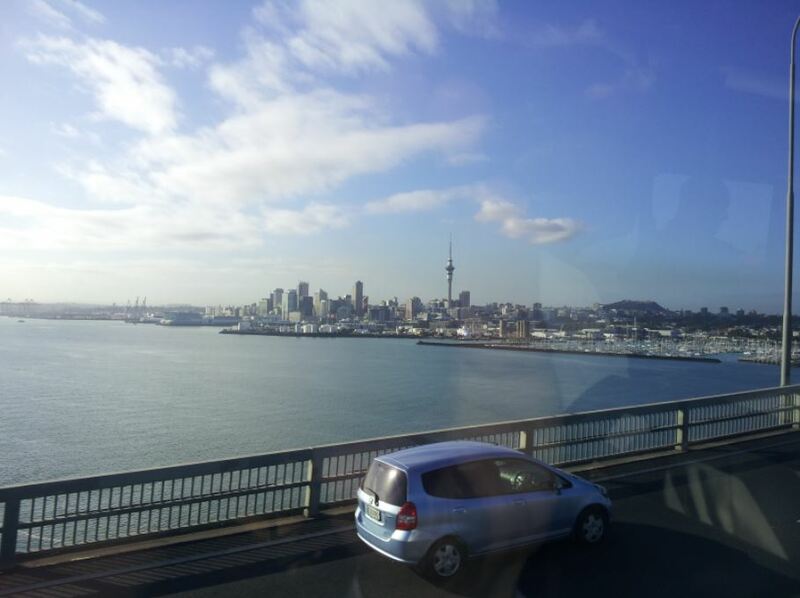 Just gotta say the view from the bridge was wonderful from the Double D this morning, but maybe not as sweet as passing all those single occupant cars crawling along the motorway. My only concern was it seemed rather slow, I assume that was the driver being cautious with the new bit of kit? Possibly, in my experience double deckers are definitely a bit slower, especially if they’re full. That’s just my personal opinion 🙂 I’m sure people will get used to them quickly enough. I’m really pleased to see this happening in Auckland! Reminiscent of my good old days in Hong Kong!!! Is there any online video news about the trial today? First double decker in AT livery, but not the first double decker as such. Several double deckers are parked in the Ritchies depot here in Swanson. Ones in InterCity livery for long distance services, and ones in Ritchies livery for local services. First double decker for PT services. Apparently only Rithcies best drivers will be at the wheel of these things and when they get more, the drivers will have to have done time driving double deckers on intercity routes first. Now fill it with real world bums, deros, half eaten burgers and other assorted garbage and we’ll see how it goes. 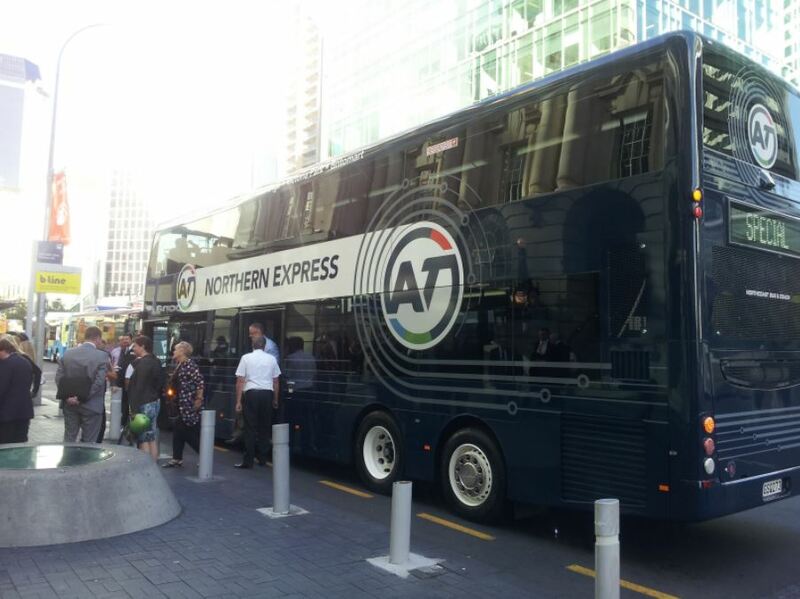 do we still use articulated buses in Auckland? Wakapacific (NZBus south auckland brand) definately has a few old dungers. They cant have much life left in them (to qualify for CBD services under AT rules). Saw one today on a school charter service for Waka Pacific – which surprised me since I’d heard they had pulled them off all school runs for safety reasons… or am I misremembering? Buses this size are not uncommon in the UK, where an outfit called Megabus use them a lot for inter-city work. Over-turning accidents are not unknown – there was one in Britain in early 2007, which eventually left three people dead, but the driver was clearly at fault in that incident. Talk about back to the future. The Mercedes Benz buses purchased by the Auckland Regional Authority back in 1973 had double doors specifically wide enough to allow people to enter and exit simultaneously. For some reason this ceased. Good to see a bus with decent seating and room for a change. Those were great, great buses. Anymore info on whether there will be lots of double decker turning up? The only Ritchies double decker running by itself . It looks like a bit lonely….